With the release of documents shortly after noon, the federal grand jury probe of the Plame/CIA scandal culminated today with a five-count felony charge for I. Lewis Libby. The criminal charges were one count of obstruction of justice, two counts of making a false statement and two counts of perjury, all related to the Plame case in 2003 and releasing information to reporters. Libby immediately resigned his post as chief of staff for Vice President Cheney. According to the New York Daily News, his post will be filled by Cheney's chief counsel David Addington. The details, according to cable news summaries of documents just released: Libby is accused of lying to FBI agents on Oct. 14 and Nov. 26, 2003; committed perjury on March 5 and 24, 2004; and engaged in obstruction of justice by impeding the investigation. The latest hipster game - Pair-o-deez: a sneaker memory game. 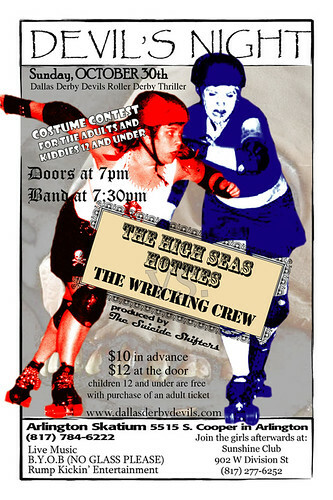 The flat track Dallas Derby Devils will skate an exhibition bout this Sunday, October 30th. Doors open at 7pm, bout at 7:30pm. Please visit the Dallas Derby Devils website for more info. The flat track Arizona Roller Derby skates this Saturday, October 29th. 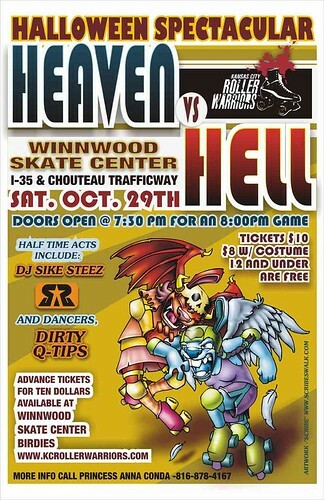 The flat track Kansas City Roller Warriors skate this Saturday, October 29th. Doors open at 7:30pm, bout at 8pm. As the Fitzgerald investigation nears its conclusion, I am becoming increasingly concerned that Bush will prevent the exposure of wrongdoing in Treasongate by pardoning any indicted members of his administration before trial. I wrote a letter in July asking the President to pledge not to pardon these persons. I have yet to receive an answer so I have organized a letter writing campaign demanding an answer. Over 4,000 people have already signed so I'd like to generate at least 10,000 letters to Bush. As some of you may recall, the President's father, President George H.W. Bush, pardoned officials under indictment in the Iran-Contra scandal. Some of those pardoned by Bush Sr. include officials in the present White House, like Elliott Abrahms, as well as others who have been purportedly linked to the falsification of the Niger documents. Those previously indicted and pardoned seem to be nearby when further crimes are committed against our country. While the White House had publicly promised its full cooperation with the investigation, their strategy has been attack, attack, attack -- most significantly on Mr. and Mrs. Wilson, the prosecutor, the Central Intelligence Agency and the press. Let's make sure that while the administration tries to divert attention away from its culpability, they are forced to pledge that those indicted by Fitzgerald will not be pardoned by the President. Today's exclusive report in La Repubblica reveals that Pollari met secretly in Washington on September 9, 2002, with then–Deputy National Security Adviser Stephen Hadley. Their secret meeting came at a critical moment in the White House campaign to convince Congress and the American public that war in Iraq was necessary to prevent Saddam Hussein from developing nuclear weapons. National Security Council spokesman Frederick Jones confirmed the meeting to the Prospect on Tuesday. Pollari told the newspaper that since 2001, when he became Sismi's director, the only member of the U.S. administration he has met officially is his former CIA counterpart George Tenet. But the Italian newspaper quotes a high-ranking Italian Sismi source asserting a meeting with Hadley. La Repubblica also quotes a Bush administration official saying, "I can confirm that on September 9, 2002, General Nicolo Pollari met Stephen Hadley." The Sismi chief's previously undisclosed meeting with Hadley, who was promoted earlier this year to national security adviser, occurred one month before a murky series of events culminated in the U.S. government obtaining copies of the Niger forgeries. World O'Crap eviscerates Wall Street Journal editorial.